It isn’t easy to keep people motivated – even when they are being paid for their time. Yes, your employees are being compensated for their work in your company, but is that going to be enough to keep them working hard for years to come? Maybe, maybe not. Human motivation is a tricky thing, as it can vary wildly from person to person. If you are going to get the best possible production from your team as time moves forward, you need to make sure you are doing everything you can to keep your staff as motivated as possible. Even without delving further into this topic, you can see why these would be desirable factors. After all, everyone likes to be treated fairly, everyone likes to feel like they are accomplishing things, and everyone enjoys having positive relationships. Whether we are talking about work or any other part of life, the points of equity, achievement, and camaraderie can all be seen as universally positive. Naturally, it is easier said than done to put all three of those factors into action in your business. You have to manage a team of diverse individuals, all with their own unique goals, motivations, and visions of the future. Something that will please one person may turn off another, so you are going to have to work hard to strike a balance which successfully energizes and motivates the majority of your staff. To gain a better understanding of how these three factors can play into your ability to motivate a staff, we are going to take a closer look at them one by one. You don’t need to be told that people like to be treated fairly – that is an obvious point, and you likely already do your best to treat your employees fairly in comparison to one another. However, the concept of fairness and equity extends beyond just treating everyone the same. Also, you need to be treating your employees correctly in a big-picture sense as compared to basic human values. For example, everyone deserves to have a safe place to work. Your employees should not be worried about their physical safety while on the job, which means going above and beyond any regulated safety guidelines for your industry. Your staff should be trained on safety, and they should feel comfortable coming to you (or another manager) with safety concerns. Fairness can also extend to the topic of compensation. Are your employees being compensated fairly for their time? While many businesses do what they can to pay employees as little as possible, you may want to hold yourself to a higher standard if you expect your team to remain motivated and driven to achieve. By paying a fair market wage – or a little beyond – your employees are more likely to feel as though they are respected. Just as your team wants to be treated fairly, they also want to have the chance to achieve while on the job. Despite what some managers and owners believe, there are employees who care about more than just their paycheck. Sure, the paycheck is the reason they show up each morning, but there is a valuable reward that comes in the form of achievement when an employee is empowered to do something remarkable. To make sure your team members feel like they have the opportunity to achieve, you need to provide them with an enabling work environment. The work should be challenging, yet also achievable, and the employees should have access to the resources they need to get the job done. When the job does get done correctly – or is done even beyond your expectations, there should be plenty of recognition and reward to go around. Everyone loves to receive a reward in the form of extra money, but it is also important to publicly praise productive employees so that they can feel good about their work while being complimented by others. Something as simple as a group email which highlights the performance of a team member goes a long way toward motivation. Also, promoting from within instead of hiring from the outside for management-level positions provides plenty of motivation for your staff to work hard and strive for upward movement in the company. For most people, the majority of their waking hours during the week are going to be spent at work. That is simply a fact of modern life – so it only makes sense that those people should be able to enjoy their time on the job. You want to develop a culture and atmosphere that promotes interaction and team building whenever possible. It isn’t necessary for everyone in the office to be best friends, but there should be plenty of camaraderie and friendliness to go around. One of the most-basic ways in which camaraderie can be promoted is through the use of team exercises. Place your employees into teams from time to time to work on projects, and make sure to mix those teams up as the months and years go by. Employees working for the same company often have a lot in common, so giving them the chance to get to know one another is naturally going to lead to friendships. Many of the things you can do to promote motivation and drive within your business are as simple as giving your team a comfortable, positive, and supportive place to come to work. The culture of any organization is extremely important, as it will often determine exactly how motivated individual employees are from day to day. Pay attention to the lessons within Sirota’s Three-Factor Theory and your staff just might take a big step forward in their level of motivation. 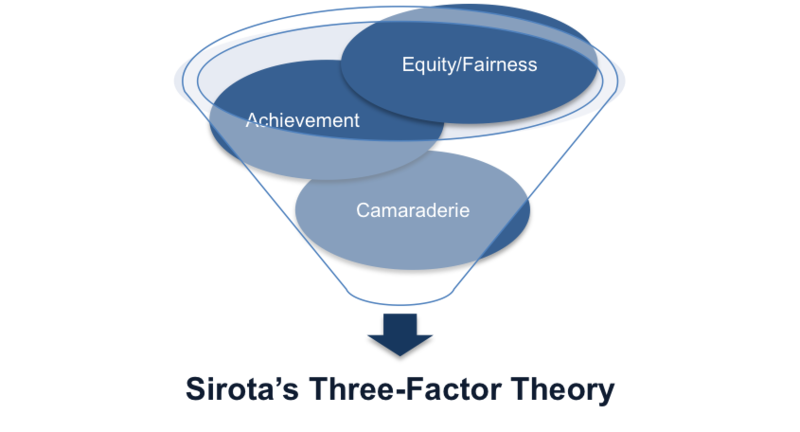 You can read more about Sirota’s Three-Factor Theory in our free eBook ‘Top 5 Motivation Theories’. Download it now for your PC, Mac, laptop, tablet, Kindle, eBook reader or Smartphone. Sirota’s Three-Factor Theory states that there are three factors which can come together to build enthusiasm within your team. Those factors are: Equity/Fairness, Achievement, and Camaraderie. Equity/Fairness: This includes work volume, employee compensation, job security, and consistency in management behavior. 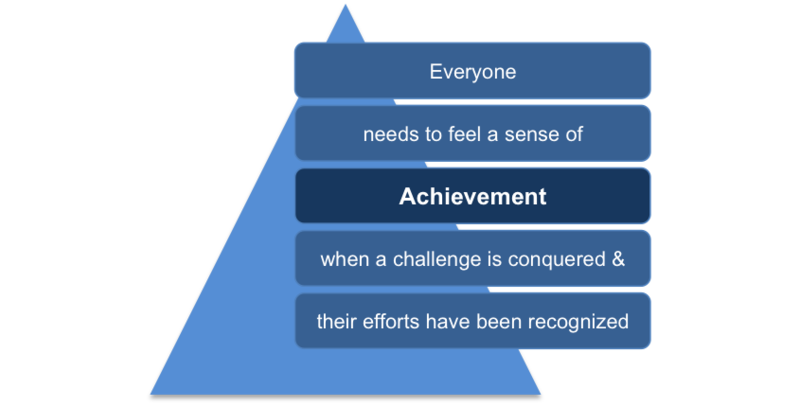 Achievement: Work should be challenging, yet also achievable, and people should have access to the resources they need to get the job done. Camaraderie: A culture that encourages cooperation and teamwork induces enthusiasm among employees. Many of the things you can do to promote motivation and drive within your team are as simple as giving them a comfortable, positive, and supportive place to come to work.